BMW Korea, the local importer and distributor of the German luxury car, on Thursday faced escalating criticism from customers, the government and the political circle, as its vehicles continued to catch fire on motorways here, despite its apology earlier this week and nationwide safety checks. Two BMW diesel vehicles -- the 320d and the 730Ld -- reportedly caught fire this morning. The drivers evacuated from their vehicles right after they saw smoke coming from the engine area, they said. 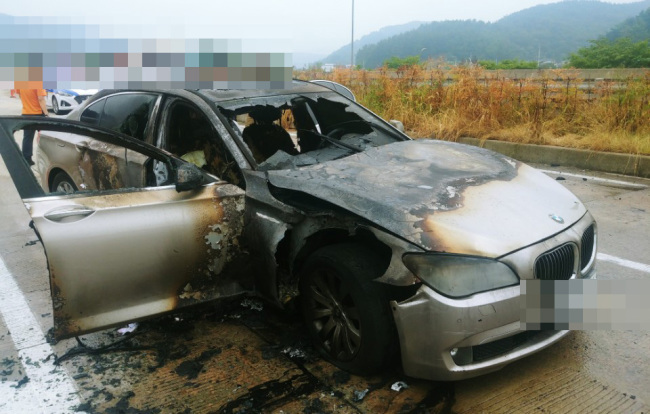 One of the vehicles, a 730Ld that caught fire on Namhae Highway in Sacheon, South Gyeongsang Province, was not subject for recall, as it was manufactured in 2011, stoking fear that other BMW vehicles not on the recall list may carry the risk of fire. According to BMW’s recall plan, the 730Ld model manufactured between July 2, 2012 and Jan. 28, 2015 is subject to recall. The Transport Ministry immediately dispatched officials of the Korea Transportation Safety Authority to the site to investigate. The incidents increased the number of the German vehicles that caught fire on traffic roads to 36 this year and eight this month. On Thursday, a group of customers stepped up seeking legal action, filing a criminal suit against executives both from BMW Korea and the BMW headquarters. The group dubbed “BMW victims” submitted a complaint to Seoul’s Namdaemun Police Station to open a probe into the allegation that the German carmaker had concealed defects from its customers. It claimed that the carmaker had known about the problem with vehicles since 2016. The Seoul Metropolitan Police Agency said it has decided to assign the investigation to the Sophisticated Crime Investigation Unit in consideration of the gravity of the issue and in preparation for additional suits by those who suffered damage. “We cannot understand why the company failed to reach a conclusion even though it conducted experiments for the last 2 1/2 years,” the group said in the statement, seeking criminal charges against six BMW executives including BMW Korea Chairman Kim Hyo-joon and Johann Ebenbichler, vice president of BMW for quality, for violating the law on vehicle management. Referring to the Transport Ministry’s investigation into BMW since last month, the group also argued that the government’s probe was insufficient as it lacks legal power to investigate the company’s alleged cover-up attempt and is limited to defining the cause of the fire. “We decided to file a complaint to immediately secure evidence of suspicions that (BMW) maliciously concealed defects like emails exchanged between BMW Korea and its headquarters,” it said. 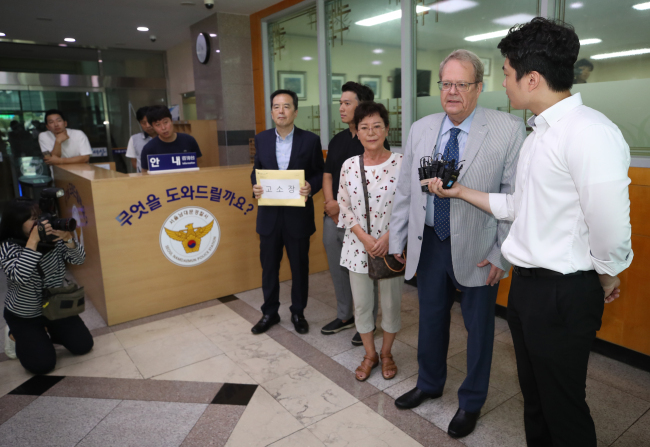 Tom Dahl-Hansen, one of the 20 plaintiffs, told The Korea Herald, “I’ve been driving BMWs all my life but the company keeping secrets and failing to inform clients of potential fire is absolutely unacceptable.” The 72-year-old Norwegian who lives in Seoul blamed the management of the German carmaker, saying they have left their customers in a dangerous situation. Ha Jong-sun of Barun Law said that 20 more BMW customers will lodge complaints next week, while also seeking a civil suit for compensation. Under Article 78 of the Motor Vehicle Management Act, a person who has concealed or reduced defects, or disclosed defects to the public by falsity, or failed to correct such defects without delay after identifying it, can be punished by imprisonment of a maximum of 10 years or a fine of up to 100 million won. Complaints have also been flooding online communities, raising concerns over safety and a drop in car value. As the controversy heightened, Transport Minister Kim Hyun-mee said Wednesday that she is considering issuing a suspension order of the operation of BMW vehicles with safety concerns. Speaking in an emergency briefing, the minister said she was reviewing suspending operations of vehicles that did not go through the safety checks and those found to have problems. Under the law on vehicles management, however, only the head of municipalities can suspend the operations of vehicles with a high risk of accidents. A conservative lawmaker, meanwhile, submitted a bill Thursday to allow the transport minister to enforce a suspension of vehicles’ operation. BMW Korea has been conducting emergency safety checks on 42 models, or 106,317 vehicles. As of Tuesday afternoon, over 40,000 vehicles had gone through the checks. The number included a total of 1,147 vehicles that received parts replacement. Concerns have been growing as the BMW fire cases included vehicles not included on the carmaker’s recall list. Of the 36, nine were not on the list and five were gasoline vehicles. The recall officially starts on Aug. 20. The replacement of the exhaust gas recirculation unit will be the main work, according to the company. The device is one of the principal devices used to reduce nitrogen oxide emissions from diesel engines. On Tuesday, Ebenbichler, in charge of BMW’s quality, said the leakage of the exhaust gas recirculation cooler was the main cause of the fires, refuting allegations of a system error.